What if the seven “characters” in Jacques the melancholy’s monologue in Shakespeare’s “As You Like It” could “meet” and share with one another the experiences they had in their particular “stage of life?” What if “the lean and slipper'd pantaloon” could let the “soldier” know how his life would change, or if both could warn the “infant” of the pitfalls of adolescence and adulthood? And then what if “second childishness and mere oblivion; sans teeth, sans eyes, sans taste, sans everything” could communicate to all his “stages” the importance of humor and perspective? The protagonist in “Three Tall Women,” currently running at the John Golden Theatre, manages that achievement with grace and charming caprice. This conversation occurs downstage with Character A lying in bed upstage behind a transparent wall in a room that mirrors the downstage room. The upstage room (the real “present” in the second act) is vacated by Characters B and C at the beginning of the second act as they move downstage and are met by Character A. Miriam Buether’s inventive set and Paul Gallo’s surreal lighting allow the audience to be reflected in the set’s transparent wall. The audience not only “listens in” to the conversation: the audience members are “in” the room, hovering over character A’s body and mind, sharing the boy’s “visit” to his mother. Act One (the real universe) sets the stage for Act Two (the surreal, alternate universe) and provides the exposition for the remainder of the play. A’s caregiver B (Laurie Metcalf) and A’s legal advisor C (Alison Pill) spar with the cantankerous nonagenarian about age, incontinence, the loss of control, the loss of dignity, the loss of memory, mortality, retribution, parenting, horseback riding, marriage, infidelity, amputation, racism, friendship, regret, and osteoporosis. Think T. S. Eliot’s “The Love Song of J. Alfred Prufrock” on steroids. Condescension and sarcasm careen around the room – from chair to bed and back – and establish the tone for the following act. Under Joe Mantello’s exquisite direction, the complex action moves forward with clarity and precision. Glenda Jackson delivers a stunning performance as the quarrelsome A whose descent into senility provides the backdrop for “Three Tall Women.” Laurie Metcalf and Alison Pill provide equally brilliant portrayals of B and C – as “real” characters and as residents of A’s “alternate universe.” The three actors clearly care for one another and support one another in bringing to life three valiant women in the stages of one life that prepares for what might be life’s most valued and happiest moment. The cast of “Three Tall Women” features Glenda Jackson, Laurie Metcalf, and Alison Pill. The creative team includes Miriam Buether (scenic design), Ann Roth (costume design), Paul Gallo (lighting design), Fitz Patton (sound design), and Campbell Young Associates (hair and makeup design). William Joseph Barnes serves as production stage manager. Production photos by Brigitte Lacombe. “Three Tall Women” runs at the John Golden Theatre (252 West 45th Street between Broadway and 8th Avenue) on the following performance schedule: Tuesday (7:00 p.m.), Wednesday (2:00 p.m. and 8:00 p.m.), Thursday (7:00 p.m.), Friday (8:00 p.m.), Saturday (2:00 p.m. and 8:00 p.m.), and Sunday (3:00 p.m.). Tickets ($47.00 - $169.00) are available at https://www.telecharge.com/ or at the theatre box office. Further information about“Three Tall Women” is available at http://threetallwomenbroadway.com/. Running time is 1 hour and 45 minutes without an intermission. 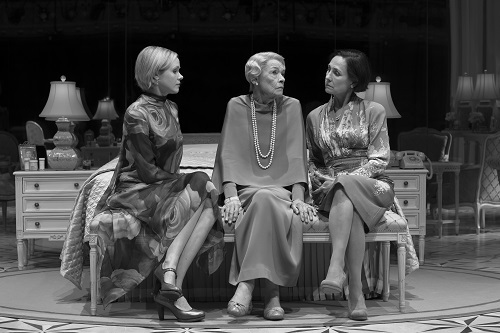 Photo: Alison Pill, Glenda Jackson, and Laurie Metcalf in “Three Tall Women.” Credit: Brigitte Lacombe.